Note: This message type is available in Icegram Engage Max plan. Step 1: Install and activate the Icegram Engage Max. Step 2: Select Icegram from the dashboard menu. Select Add New Campaign. Step 3: Select Interstitial as the message type. Step 4: Choose a Theme for your message from the drop-down. Step 5: Insert a Wait bar title. 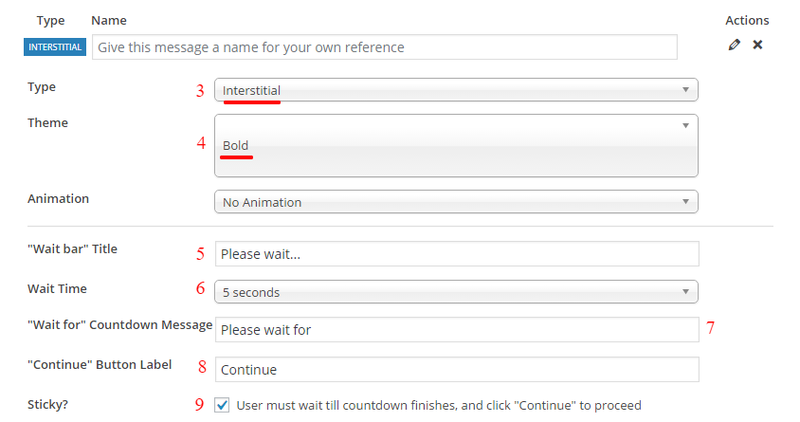 Step 6: Adjust the Wait time for the time period you want to show the Interstitial message. Step 7: Add a “Wait for” countdown message. Step 8: Add a label for Continue button. Step 9: If you want the users to wait till the countdown gets over, check the box in the option “Sticky?“. Step 10: Fill in other details like headline, message body, buttons, forms, etc like you do for other Icegram message types. Step 11: Save Draft / Publish the campaign. Note: Read more about the Interstitials message type.